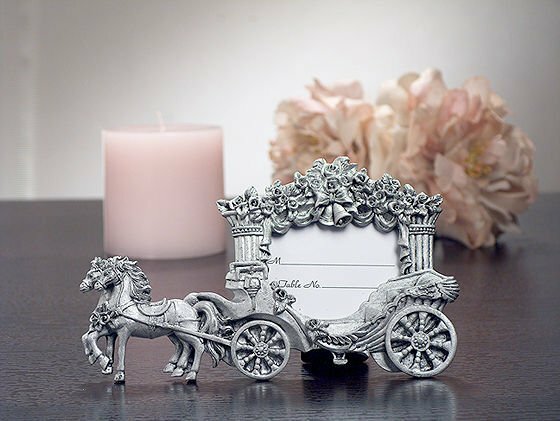 Featuring an ornate horse drawn wedding carriage design, these pewter finished resin photo frames are an enchanting way to greet guests at the reception of your fairytale themed wedding. A sweet memento of your special occasion, your guests will love to bring these frames home to use. Come individually packaged in a white gift box. NOTE: Color may be darker than shown. Please see extra photo. Can I order a sample first? Absolutely, you can get a sample of it at a special price of $0.49. Just enter 1 in the quantity box then complete the check out. I selected one frame want to know whether it comes in a individual box or not? Yes, the Wedding Coach Pewter Finish Place Card Frame will be individually packaged in a white gift box. 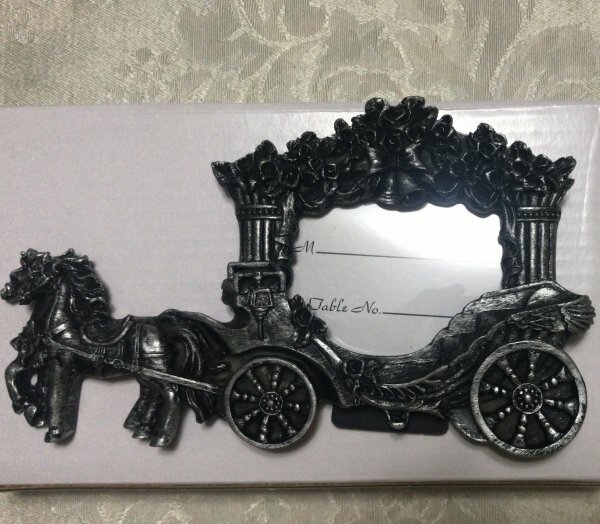 I want to know if the pewter wedding carriage comes in gold? The other color that we have is the Wedding Coach White Finish Place Card Frame; however, this is currently out of stock. We expect it to be available again on October 30, 2018. You can still lock-in today’s sale price and order today. We will ship you the item as soon as we get it. Just add it to your cart and proceed normally through the checkout process.